We liked the beer in here - superb condition Timothy Taylor - nearly the full range including Ram Tam and a Blonde (previously unseen). However, it was setup solely for fining and nowhere for the drinker to sit, apart from at a few high stools at the bar. Strange atmosphere of people murmuring, afraid to not talk too loudly. Not what we wanted or expected really, but I am sure the food was excellent. Excellent Dales village pub - no more to be said. Stopped off on Saturday on a trip around The Dales for some food. Weren't sure whether to choose between The Blue Bell Inn or here but a sign outside the Blue Bell, welcoming mucky women amongst others, was the deciding factor for us. Timothy Taylors place with three choices: Landlord, Golden Best and Ram Tam. Had a pint of Ram Tam which was fine, as was the food and staff were pleasant. Quite quiet in terms of atmosphere but that is perhaps to be expected at 2pm on a Saturday. I stayed here many years back, and had a fantastic time. Have popped in more recently, and I'm glad to see it's still a fine place. Visited in July and it's just as good as on previous visits. 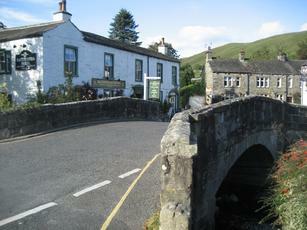 We think the food is the best in Kettlewell, (it's where the locals go for a night out) and beers well kept. Lanlord and staff very pleasant. It's only drawback for the drinker is that it's more hotel than pub so lacks the ambience of the other 2 village pubs.